I read this article and found it very interesting, thought it might be something for you. The article is called Face Scrub For Oily Skin and is located at https://homemademasks.net/homemade-face-scrubs/facial-scrub-with-cornmeal-and-orange-juice-for-oily-skin/. Cornmeal and orange is a perfect facial scrub for oily skin and it helps remove excessive sebum. If you have some oranges in your kitchen then you can offer some balance for your oily complexion. 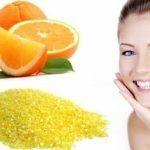 The vitamins from the orange juice will nourish and you will see the difference in the way your complexion will feel and look immediately after this facial scrub. Oranges are very good for removing sebum excess while also making your skin texture look beautiful. Combine it with the cornmeal. Mix the ingredients until they form a paste. Apply the scrub on your clean face and neck taking care around the sensitive eye area. Gently massage the scrub on your skin in a circular motion for about 2 minutes. This treatment should be repeated once a week.